Anyone should be proud for finishing Dark Souls II. From Software's sadistic action games are punishing by any standard. The community around the games, however, keeps upping the ante. What's one way to make Dark Souls II harder? Beating it in first-person with an Oculus Rift. Twitch streamer Dirtythekid finally pulled this off yesterday on a livestream, dragging down the health bars of the game's final trio of bosses: Throne Watcher, Defender, and Nashandra. 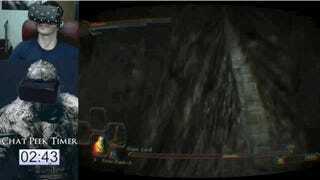 Playing Dark Souls successfully is about awareness. You want to know what's around you at all times. A single enemy that you've defeated a million times can quickly take your life if they've managed to sneak up behind you. Playing Dark Souls in first-person removes much of this awareness, as it limits your perspective. 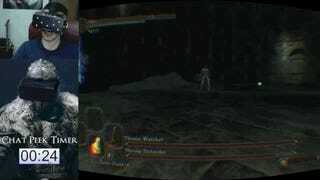 Often in Dark Souls, I'll be running away from an enemy while spinning the camera around to keep an eye on the other creatures in the area. With an Oculus Rift on your head, in order to maintain spacial awareness, you literally have to move your head around. It's yet another piece of information to keep track of while playing. This is mostly problematic when Dirtythekid encounters some of the game's most towering enemies. He's simply unable to realize what attacks are coming and when they might hit him. I cannot imagine even contemplating this feat, but I'm glad we have people like Dirtythekid.